The Siege of Veii was one of the most important sieges in Roman history. The Siege itself took place c.a. 404-396 BCE, lasting for an approximate eight years! (Tucker, 2011) These dates are, however, disputed due to the fact that Livy documents the siege as lasting ten years, which clearly is contradictory. Nevertheless, as with all battles, it is vital that we first learn why the event took place so we can better understand the significance of the event. In the case of this particular siege, most of the information that we have is based on documentation by Livy, who lived c.a. 64 BCE – c.a. 17 A.D., several hundred years after the event being considered took place. This is somewhat problematic, because this leaves some uncertainty in the accuracy of his telling of the events. Regardless, we should be led to wonder, why did this conflict occur and what were the outcomes? As far as we can tell, one of the main issues between the Etruscans and Roman’s was that Rome was unable to expand northward because the Etruscan city-state of Veii was established right in their way (approximately 16 km away). This would not normally be too big of a problem, however the city-state of Veii was quite large (about 562 km²) and was clearly capable of withstanding Rome (Lendering, 2014). This fact alone makes this siege far more significant and concerning for the Roman’s than most other invasions from the time period. Livy begins his documentation of the events between Rome and Veii by saying, “Whilst peace prevailed elsewhere, Rome and Veii were confronting each other in arms, animated by such fury and hatred that utter ruin clearly awaited the vanquished.” (Livy, The History of Rome, 5.1). It is clear that there was building tension, even hatred between the two parties and thus war between the two was imminent. Immediately the Roman’s begin to establish a solid blockade about the Etruscans. One of the longest sieges in history had just begun. While Rome was busy overtaking Fidenae, the Veientines began to build up walls for defense against the inevitable incoming invasion from Rome. These massive walls proved to be a very difficult obstacle for the Roman army to overcome. The situation did not become any better with the Capenates and the Faliscans joining theVeientines under the assumption that if Rome took Veii they would surely be next. In this particular siege, the Roman’s stood by their defenses year-round, for a documented 10 years according to Livy. “… (Veii) since after being besieged for ten summers and winters and inflicting more loss than it sustained, it succumbed at last to destiny” (Livy, The History of Rome, 5.22). This incredible display of persistence and determination shows the will power and diligence that the Roman army possessed towards their cause. The resources, time, and effort spent in this siege did have lasting negative effects on the people involved during the grueling time of the invasion. In the end, the solution that yielded the sweet taste of victory was a simple undermining strategy. The men were split into six work forces that would trade off (as one of Rome’s primary advantages was manpower) digging into a mine that was to lead straight into the enemy citadel for invasion. It has been suggested that perhaps the Roman’s ended up using an Etruscan sewer system as a passage, due to the fact that the Etruscans were known for their complex engineering (Lendering, 2014). Once the mine was complete, the Roman army used their established passageway to disoriented the besieged by breaching directly into the besieged land as well as invade from all directions round about the wall, which the Roman’s had ultimate control over. The Veientines were surrounded, and had inevitably lost to the Romans. The way that Livy documents the news of victory is fascinating as it uncovers the true emotions of victory within the Roman lifestyle. Livy says, “when the capture of Veii was announced in Rome, after so many years of undecided warfare and numerous defeats, the rejoicing was as great as if there had been no hope of success” (Livy, The History of Rome, 5.23). It is also states that the people continued on in a public Thanksgiving for four days. After overtaking the seemingly most probable enemy to the Roman people, the general attitude quickly became one of ease and joy. The Romans had put lots of time and resources into the siege and now finally had the opportunity to reap the benefits, including an “enormous wealth” that was taken from the Etruscans (Livy, The History of Rome, 5.21). This battle is significant not only to our political and social understanding of Rome, but specifically to the tactical/technological aspects of Rome. The use of undermining and other siege engines clearly demonstrates the progression of siege warfare even early in Rome’s history. The applications of such tactics and technology will only grow in complexity, and ultimately provide greater victories for the Roman’s in the future. Contributors, Wikipedia. “Battle of Veii.” 30 November 2013. Wikipedia.org. Web. 17 April 2014. <http://en.wikipedia.org/wiki/Battle_of_Veii>. Dennis, George. “Map of Veii.” 5 November 1848. Map. 17 April 2014. <http://en.wikipedia.org/wiki/File:Map_of_Veii.jpg>. Lendering, Jona. “Veii.” 23 March 2014. Livius.org. Web. 17 April 2014. 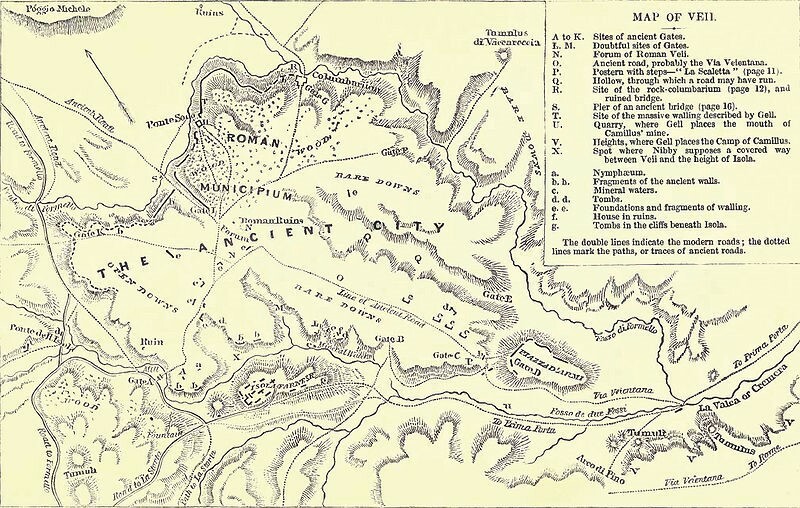 <http://www.livius.org/person/marcus-furius-camillus-1/marcus-furius-camillus-2/>. Livius, Titus. Livy’s History of Rome: Book 5. Ed. Ernest Rhys. Trans. Rev. Canon Roberts. 1905. Web. 17 April 2014. <http://mcadams.posc.mu.edu/txt/ah/livy/livy05.html>. Nossov, Konstantin. Ancient and Medieval Siege Weapons. Guiolford: The Lyons Press, 2005. Book. 28 March 2014. Tucker, Spencer. Battles That Changed History: An Encyclopedia of World Conflict. Santa Barbara, 2011. Web. 17 April 2014. <http://books.google.com/books?hl=en&lr=&id=SWBkx0UlgMAC&oi=fnd&pg=PA25&dq=siege+of+veii&ots=m55OqprHOe&sig=5KbWdDbFwAS1o_1GU1epNXMB1uU#v=onepage&q=veii&f=false>. Ward-Perkins, J.B. “Veii: The Historical Topography of the Ancient City.” Papers of the British School at Rome 29 (1961). Web. 17 April 2014. <http://www.jstor.org.hal.weber.edu:2200/stable/40310633>.